This handsome gold and olive clapboard building with operable shutters and double-hung windows takes its styling cue from an earlier era. From New England to Milwaukee to Seattle, areas with bountiful local wood supplies favored clapboard siding. 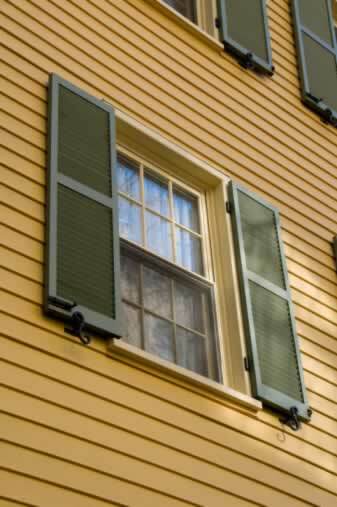 Segmented double-hung windows let in those welcome sunny days, and shutters latch against pounding rain, icy winds, and flying debris from a Sou'wester storm. The windows, shutters and siding took quite a beating under those conditions, but the style created an Americana look that is beloved to this day. Happily, modern vinyl or fiber-cement siding, insulated windows sectioned with synthetic muntins, and shutters made of vinyl, fiberglass, or aluminum eliminate almost all of the painting and upkeep while retaining that historical look. The color is part of most of the products. Yes, you can have your cake and eat it, too.